Conversations at my dinner table frequently go like this: “Eat your beans please.” “I don’t like it dad.” “I understand but you need to eat your beans please.” “But I don’t like it dad.” “You need to eat your beans.” On and on it can go. Conversations in jazz tunes run in similar fashion, back and forth between soloist and band like a child with his mom and dad. Listen to the world around you. What do you hear? A gentle murmur of conversation in the coffee shop punctuated occasionally by laughter. The loud lady in the corner telling stories of her coworkers sometimes rising to the surface, sometimes sinking into the murmur. The thunk of the espresso group head being emptied for the next shot by the barista. Maybe you hear the soft rustle of pencils on paper as 30 students furiously compose their final essay of the school year. The rhythmic tap-tap-tap of the teacher’s feet as she paces up and down the rows of desks. All of these things can be imitated in music. These everyday sounds and experiences are what make jazz. Perhaps the single most memorable moment in the book is Marsalis’ early encounter with trumpet great Dizzy Gillespie. 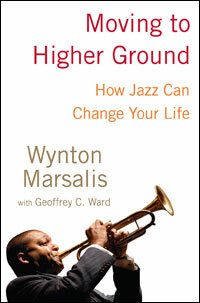 Marsalis’ father was an accomplished musician who once took the teenage Wynton backstage at a Dizzy Gillespie concert. When his father introduced Wynton to the great trumpet player he said, “This is my son, he plays the trumpet.” Wynton recalls the moment vividly when Dizzy hands him his trumpet and says “Play something.” Partly from nervousness, partly from the fact that Dizzy played with a tiny mouthpiece, Wynton couldn’t get a clear note out. Embarrassed, Wynton handed back the horn. Dizzy leans down and says softly in his ear, “Practice motherf-r.” While this is quite the off-color statement, it resonates strongly with the aspiring great musician. It instantly alienates the wannabe and prods the serious musician to work. If you want to play with the greats, you have to know your instrument. Practice, practice, practice. It takes more than one person to have a conversation so it becomes vital to play with other musicians. I always encourage my students to find people to play with. The easiest medium to do this with is the blues: there are few “wrong” notes and it is natural to hear the “conversation” of the music. Marsalis devotes a chapter of the book to reviewing individual musicians and their personal style. It is so enlightening to see how the uniqueness of each musician’s style is often a response to the greatest weakness he has to deal with. Miles Davis had a soft embouchure and struggled playing “fast and fiery” like his bebop inspiration Dizzy Gillespie. His natural tone was “rich with emotion, so it made more sense for him to play sustained notes and leave silences between phrases.” This last year I have spent a lot of time listening to Kind of Blue, Miles Davis’ most influential recording. I quickly found that I could hear his trumpet voice in so many other recordings because I learned to hear what made his tone unique. Like a child comes to recognize his mother’s voice or a mother can pick out the cry of her baby even among the din of a room full of crying children, listening to music can help you recognize and “know” the greats who came before us. Perhaps most resonant is the theme throughout the book of sharing. A musician who does not share his gift with others, does not pass on the legacy and language will not be remembered long nor will he find and maintain musical friendship and camaraderie very long. Marsalis himself maintains a rigorous performing schedule in both classical and jazz music. He is also a first-rate educator holding the position of artistic director of Jazz at Lincoln Center. ← How Many 5/4 Measures are in Death Cab for Cutie’s The New Year?